Former CIA Man: Don't Bet on Israel's Bombing Iran on My Speculation! 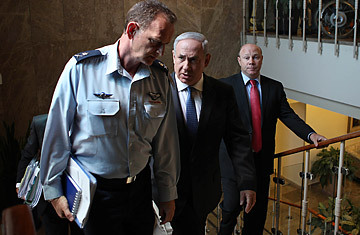 Israeli Prime Minister Benjamin Netanyahu (C) speaks to his military adviser Major General Yohanan Locker (L) as he arrives to attend the weekly cabinet meeting at his Jerusalem office on June 26, 2011 in Jerusalem, Israel. To paraphrase Ronald Reagan, I wonder what the Ten Commandments would have looked like if Moses had first discussed them on talk radio. Having found myself at the center of a bizarre series of stories claiming that Israel is planning to attack Iran in September as a result of some speculative answers to a talk-show host's questions, I think I now know. Last week, my friend Ian Masters, who hosts the Los Angeles talk-show "Background Briefing", called me up to talk about the Arab spring, and especially what would happen if Israel were to attack Iran. He was struck by the comments of recently retired Mossad chief Meir Dagan, saying that an increasingly paranoid and isolated Prime Minister Benjamin Netanyahu was considering launching a reckless attack on Iran's nuclear facilities, and doing that soon. Would an Israeli strike put a spike in the Arab spring? That was unknowable, I said, but the resulting crisis would certainly give repressive regimes the excuse to crack down a lot harder on the street. On air, we got into it with Syria, but then quickly moved to Dagan's comments. I noted there have been other recently retired senior Israeli security officials who'd said much the same thing, including the well-respected chief of staff, Gabi Ashkenazi. So far so good, but, as these things go on radio, fact quickly turned to speculation. I offered that Israelis of this stature don't wash dirty laundry in public unless there's a serious problem, and therefore that I doubted that these comments were all part of some grand, calculated bluff to intimidate the Iranians to give up their nuclear program under threat of being bombed. Warming to the subject, I chattered on about how I'd heard there was a "warning order" at the Pentagon to prepare for a conflict with Iran. I was about to add that that this was not unusual; there are warning orders all the time, and it could have nothing to do with Israeli or anything it was or wasn't planning for Iran. (Defense Secretary Leon Panetta, after all, is accusing Iran of being behind the sharp uptick in deadly attacks on U.S. forces in Iraq.) But time was short, and the host needed to finish up for the next guest. This was a wide-ranging speculative conversation on a local radio station, two like minds kibitzing, as media pundits so often do, with no inside information to back our interpretations of the significance of the flood of former senior Israeli security officials warning that Netanyahu is crazy and likely to do something rash. "If I was forced to bet," I ventured, "I'd say we're going to have some sort of conflict in the next couple of months, unless this is all just a masterful bluff  which I can't believe the Iranians would succumb to  I think the chances of it being a bluff are remote." Not exactly claiming to know any more than any other tea-leaf reader. And when Masters asked me when I thought this hypothetical attack might hypothetically occur, I blithely suggested September. I was only adding two plus two: a September attack would allow Netanyahu to destroy Iran's nuclear facilities and wreck plans for a U.N. vote on Palestinian statehood, which is slated for September. I would have added that in the Middle East, two plus two rarely adds up to four. But I was definitely out of time. When I hung up the phone, I was sure Masters had lost more than a few listeners. After all, what I'd said was a tedious rehash of various media reports. I would have forgotten it altogether were it not for the blogosphere's version of a Pacific hurricane. I don't know where it started, but soon the choice bits of our conversation were being rebroadcast as a danger signal flashing bright red: "Former CIA Official: Israel Will Bomb Iran in September," read the headline in the Huffington Post. The Huffpo's headline sparked a frenzy in Middle Eastern media outlets ranging from Israel's Jerusalem Post and Haaretz to Hizballah's TV station al-Manar. Their reports implied that I was some sort of unimpeachable authority, talking with the certainly of an insider looped into the plans and intentions of the key decision-makers. And then came the hate mail. One former State Department official wrote that my comments were all the proof he needed to know that I'd "gone rogue." A well-known pundit called me a loose cannon. By Monday, the former State Department spokesman P.J. Crowley started tweeting that I didn't know what I was talking about. His tweets also made front-page news in Israel. Crowley is right about me speculating about things I don't know a lot about. (Isn't that what commentators do more often than not?) But my question was, didn't he have the time to check the radio's Web page and listen to the interview? My editors at TIME certainly have. Or, more obviously, I wondered why Crowley and everyone else didn't notice I hadn't drawn a government check in more than 12 years, and therefore wasn't bringing any inside knowledge to the subject. And I'd certainly never claimed a back-door access to Netanyahu's inner circle that would give me any privileged knowledge about a planned attack. What I am now certain of, however, is that my speculative wandering accidentally kicked a hidden hornets' nest. For all I know, maybe there really is an attack planned for September. Or, more likely, the problem is that it's July, it's hot, and everyone's bored of the Murdoch stuff. And, here I leave pure speculation to return to fact: It's lucky tweets, talk radio and blogosphere hysteria don't drive the decision making in Jerusalem and Washington. But, then again, what do I know? Robert Baer, a former Middle East CIA field officer, is TIME.com's intelligence columnist and the author of See No Evil and The Devil We Know: Dealing with the New Iranian Superpower. See if the Mossad is targeting Iran's nuclear scientists. See photos of clashes in the Middle East.